Apart from the ability to copy, extend, resize, delete, and format partitions, one particularly interesting feature is the ability to create a bootable Windows PE OS that runs AOMEI Partition Assistant SE before Windows starts up. I've used several free partitioning tools, and I have to say that I really like AOMEI Partition Assistant SE. Not only is the interface well thought-out and easy to use, but it also has all the basic, and advanced, features anyone would expect...all for free. One feature worth mentioning again is the Windows PE version of AOMEI Partition Assistant. With it, you setup partitions with ease even if you don't have an operating system installed. The program is the same as the one that runs in Windows but is instead launched from a disc or USB device, like a flash drive. You can build this Windows PE disc from the "Make Bootable Media" wizard, which lets you burn directly to a disc or USB device, as well as export the program to an ISO file, which you can then use in a virtual machine or burn to a disc or burn to a USB device yourself. 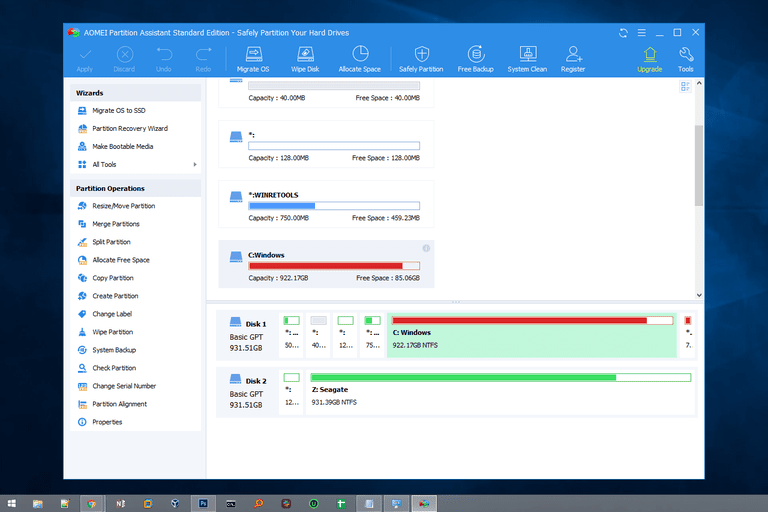 Because there's also a professional version of AOMEI Partition Assistant, there are a handful of features that aren't available in this Standard Edition. Even so, there are still more useful tools in this free version than I've seen with other free disk partitioning programs.